Atos signed a HPC agreement with the C-DAC (Centre for Development of Advanced Computing), an organization within the MeitY (Ministry of Electronics & Information Technology of India), in the presence of the French Minister for External Affairs Mr Jean-Yves Le Drian, and the Secretary of the Minister of Electronics and IT India, Mr Ajay Prakash Sawhney, in New Delhi. This agreement is part of India’s NSM (National Supercomputing Mission). “We’re delighted to officially become today the technology partner of C-DAC for HPC-related platforms and to participate in India’s prestigious NSM (National Supercomputing Mission) program. We are honoured that our BullSequana supercomputers, will be empowering Indian academic and R&D institutions across the country to accelerate their research and at the same time support India’s ambition to be a leader in HPC.” said Pierre Barnabé, Chief Operating Officer, Big Data & Security at Atos. 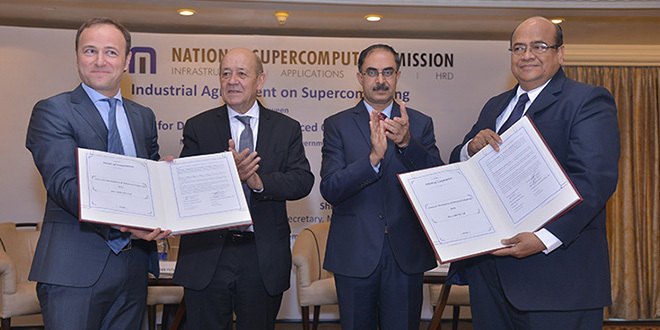 “This new agreement illustrates the strategic relationship and partnership between France and India and will enable India to leapfrog to the league of world-class supercomputing power nations.” said Dr. Herman Darbari, Director General of C-DAC. This project will see Atos deploy its BullSequana supercomputers, including the recently announced BullSequana XH2000 in various academic and research institutions, making Atos a leading supercomputing provider in India.